*This post is sponsored by Lowe's, a brand we use and believe in. All content, ideas, and words are our own. Thank you for supporting the brands that support the Grit and Polish. So we eagerly upgraded the Dexter Houseâ€™s basic faucet with this lovely Elements of Design model that has a sprayer. I think of a faucet as the centerpiece of a kitchen. Itâ€™s functional and beautiful and can set the tone for the rest of the space. And perhaps the best part about them is that theyâ€™re easy to replaceâ€¦no renovation necessary. So if yourâ€™s is leaking or causing you heartache or just unpleasant to look at, do yourself a favor and replace it. Today weâ€™re going to walk you through exactly how. Garrett put together a short video showing you exactly how he swapped out the faucet at the Dexter House. This project requires just one tool - a wrench (we used this Craftsman one) - and basic plumbers tape. 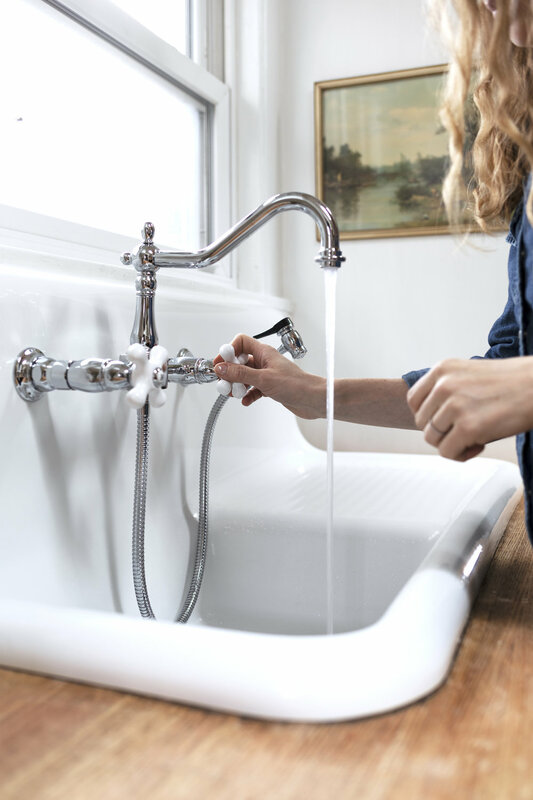 Now that you see how easy it is to replace your faucet, I wanted to share a few things to consider when selecting your new centerpiece. There are two major types of faucets: deck-mount and wall-mount. We selected a wall-mount faucet at the Dexter House, which is my favorite option when it works. I say â€˜when it worksâ€™ because there are a few issues with them. First, wall-mount requires plumbing supply lines to be installed in the wall behind the faucet, which takes more effort than the plumbing for a classic deck-mount. Second, if those plumbing lines are in an exterior wall than you you have to worry about the pipes freezing. What I do love about wall-mount is that they free up countertop space and have a nostalgic feel. The alternative, deck-mount faucets, sit on your countertop and either have 1 or 3 holes. The benefits to these are that the plumbing is easier since the supply lines go inside the sink cabinet. There are also a lot more options when looking for deck-mount faucets. But no matter if you have a deck-mount or wall-mount faucet, make sure you stick to that same set up when buying a new faucet (unless your planning a bigger project). Probably the biggest question I get about faucets is which finish to pick. Every kitchen is unique, but I use a couple rules of thumb to answer this. First, I like to match the finish of all the faucets in the kitchen (so the pot-filler and the main faucet are the same finish). Second, I limit the number of metals in the kitchen to two (in addition to stainless steel). At the Dexter House the cabinet hardware is chrome and the lighting is oil-rubbed bronze so these were the two options for the faucet. The faucet is a great way to reinforce the style of your kitchen: modern, traditional, industrial, etc. 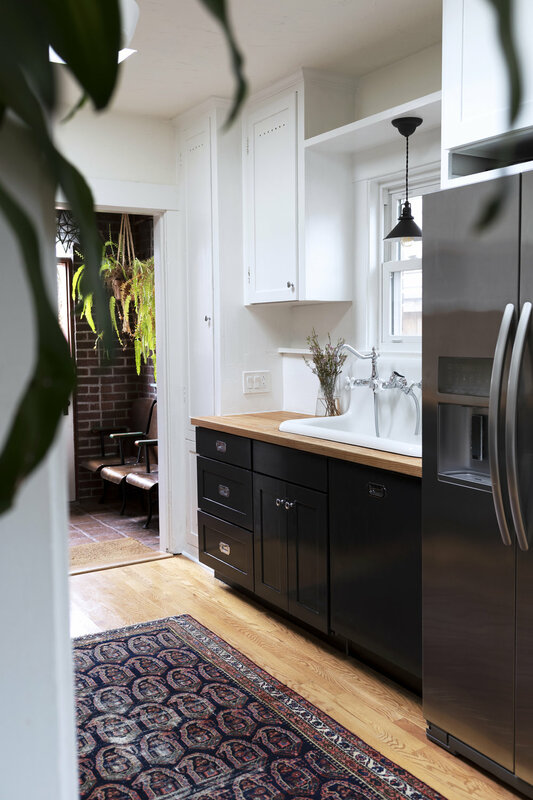 We picked out a fairly traditional faucet for the Dexter House kitchen because this home dates back to 1905 and we wanted to highlight itâ€™s historic vibe. I do love a good modern faucet with simple lines, but would save that for a more-modern or transitional space. Lowes has a ton of great faucet options in addition to the Kingston Brass number we selected. Here are ten of our favorite kitchen faucets from Lowes, including both deck-mount and wall-mount options (psst: we used #1 in the Porch House kitchen!). Thatâ€™s everything we know about selecting and replacing a kitchen faucet. But weâ€™d love to hear from you. Do you love your kitchen faucet? Hate it? And if the latter, have we persuaded you to replace it?